At the 2016 Geneva Motor Show, Bentley impeccably gained the eyeballs with its all new Mulsanne Speed, EWB and the Bentley Mulsanne 2017. The model gains some new upgrades to its 6.75 liter engine and doesn’t compromise even a bit with its luxury stats. 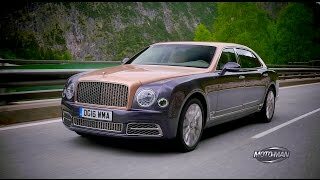 Let us have a look at the review of Bentley Mulsanne 2017 to know in detail about it. The interior of Bentley Mulsanne 2017 carries similarities with its predecessor models. It has the same dash housed with four spoke steering wheel, a center console and dual tone door panels further adoring the scenario. There is a new updated infotainment system that further accompanies a navigation system; featured through an eight-inch touchscreen display with a 60-gigabyte hard drive. Not only get this rear rear-passengers too get a bit of extra leisure of entertainment through two 10.2 inch Android tablets. 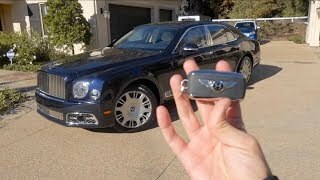 Rounding up the entire interior details of Bentley Mulsanne 2017 I would call it gorgeous and luxurious with the dark ambience, the woodwork and the leather work. 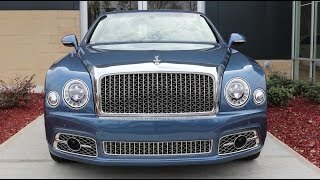 The exterior of Bentley Mulsanne 2017 is almost the same as that of its predecessors. You can still notice the wide grille sitting amidst the LED headlights and a sportive air dam beneath it. However a closer inspection will highlight some new changes like the new front grille and the bumper. The vertical slats with mesh pattern and the LED headlamps too receive bit of new touch. Moving towards the side profile there is only major change and that’s with the B-shaped wing vent fixed into the lower section of the fender. The rear section of the model has a set of new taillights above the wider shaped bumper and a beefy trunk lid as new amalgamations. Apart from these the exterior details of Bentley Mulsanne 2017 are same as that we have noticed in the preceding models. Beneath the hood of Bentley Mulsanne 2017 is a 6.75 liter V8 engine generating total output of 505 hp and peak torque of 1020 nm paired to eight-speed ZF automatic transmission. The unit thus can sprint from 0-62 mph in just 5.1 seconds while the top speed of Bentley Mulsanne 2017 touches the mark of 184 mph.